Ah, Valentine’s Day. For most people, it’s a day to celebrate love. And, we get it, love is great. We need love. We love love. But, we also love that almond day is around the corner! But, if we’re being totally honest, Valentine’s day to us = an opportunity to enjoy more treats. Because, can you ever get enough fresh strawberries topped with whipped cream and chopped almonds? So let’s extend the joy from Valentine’s Day to celebrate Almond Day (February 16th) too! We partnered with our friends at California Almonds to bring you 5 perfect Valentine’s Day pairings. A couple of years ago Wendy and I went to a super fancy restaurant on top of a museum in Paris. We had one of the best meals of our lives that night. When the chef brought out the dessert menu, we were intrigued by how simple it was. One of their signature dishes was just strawberries topped with whipped cream. Strawberries? Whipped cream? Dessert? Really? We took a chance and ordered it. And when I say we devoured that dish with a quickness, I’m not lying. What made it so special was the focus on simple, high quality ingredients. The strawberries were plump, juicy and sweet. The whipped cream was rich and blended to perfection. Every bite counted. Ever since that trip, we’ve been enjoying fresh berries topped with unsweetened whipped cream (there are also dairy free options) as a nightcap. The only addition we made was adding chopped almonds. We love almonds because they are a perfect trifecta of taste, health and convenience. For this recipe, all you do is fill a bowl with ½ a cup of your favorite berry. We used strawberries for this addition, but we often use blueberries as well. Top the berries with 2 tablespoons of unsweetened whipped cream and then sprinkle on some chopped (or sliced) almonds. We quickly chopped the almonds in a food processor, but you can buy them pre-chopped as well. Enjoy! 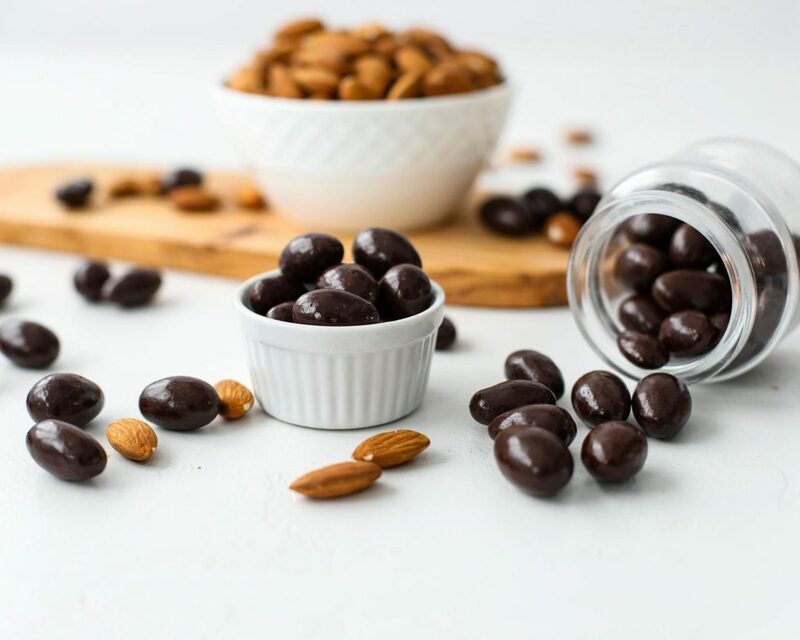 These dark chocolate covered almonds are not only delicious, they also provide the perfect boost of energy. Dark chocolate is rich in polyphenols, flavanols, catechins, and other powerful antioxidants. Some studies have even shown that the flavanols in dark chocolate can improve circulation and may help with blood pressure control. You can either buy this pairing premade (like we did here) or make it yourself. To make this recipe you’ll need 1 cup unsalted almonds and 100g of dark chocolate (70% cocoa or more). Break your chocolate bar into 3-4 smaller pieces and add the pieces into a small saucepan. Cook the chocolate over low heat for about 3 minutes, stirring frequently with a spoon until all the chocolate is melted. You can also melt the chocolate using the double boiler method. Simply fill the bottom pot with water and put the chocolate pieces into a bowl that fits securely over the pot (making sure the water does not touch the bowl). Cook over low heat, stirring until all the chocolate is melted. Then pour the melted chocolate into a bowl of almonds. 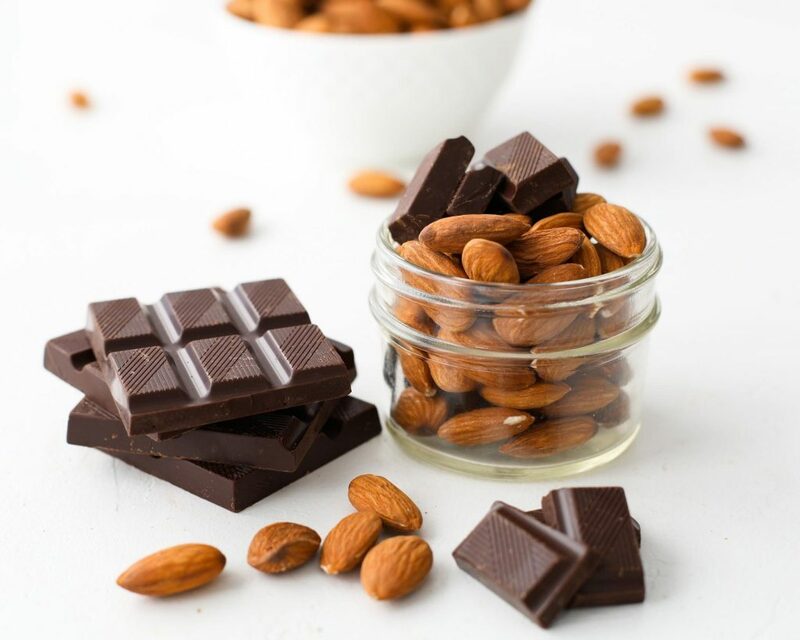 Mix together well with a spoon, so that all the almonds are covered evenly with chocolate. Using a spatula, scoop the chocolate covered almonds, and shake off any extra chocolate. Place the almonds on a baking sheet or tray lined with parchment paper. Place in the refrigerator for at least 25 minutes. Store in the fridge until they’re ready to be enjoyed. Valentine’s Day or not, fruit kabobs are easy, healthy, and delicious. This is one of our favorite treats when we’re in the mood for a little something sweet. The good thing about this recipe is that you can switch up the fruit. We used strawberries, banana and kiwi here, but you can also use melon and/or other berries. To make this dish, cook the chocolate using the same method above. While that’s cooking, prep the fruit by cutting off the tops of the strawberries, slicing the banana, and peeling + slicing the kiwi. Assemble your kabobs by alternating between strawberry, banana, and kiwi on each bamboo skewer. 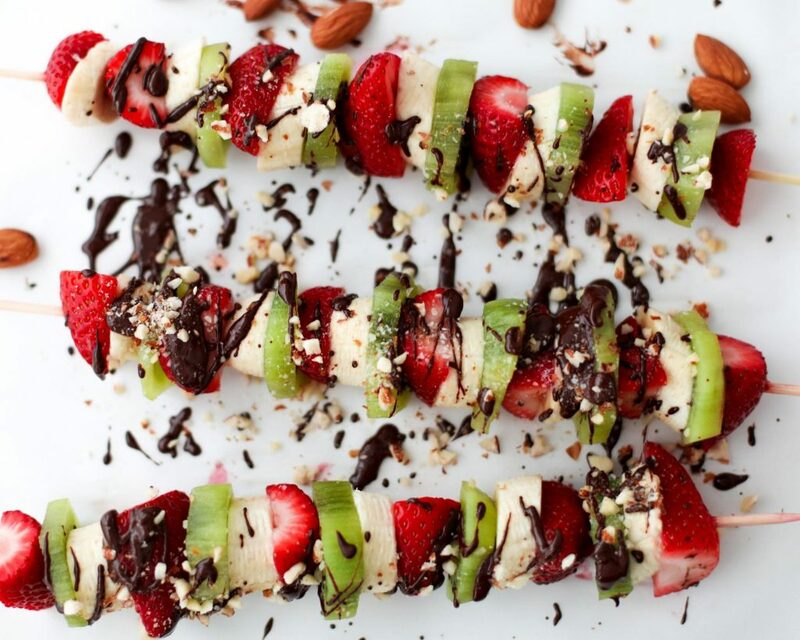 Drizzle the melted chocolate over your kabobs and top with chopped almonds. This provides a source of good fats. We usually don’t like to get hyped up by “trendy” health foods. But in this case, it’s kind of hard not to. We legitimately love the taste of matcha and are here for the health benefits. Matcha has antioxidants which can help fight free radical damage. For this recipe you’ll need 100-grams of dark chocolate, 1/4 cup of creamy almond butter and 3/4 teaspoons of matcha. Start by breaking the chocolate into small pieces, then melt it using the same method above. If your almond butter is fairly liquid, then you’re ready for the next step. If not, you may have warm it over very low heat for 2-3 minutes, stirring frequently with a spoon until all the almond butter is completely smooth and easy to pour. Once those are both melted, assemble 6 cupcake holders on a tray or within a muffin pan. Pour one small layer of dark chocolate in each cup. Then pour a layer of almond butter. Top with another layer of dark chocolate and then place into fridge for 2-3 hours. 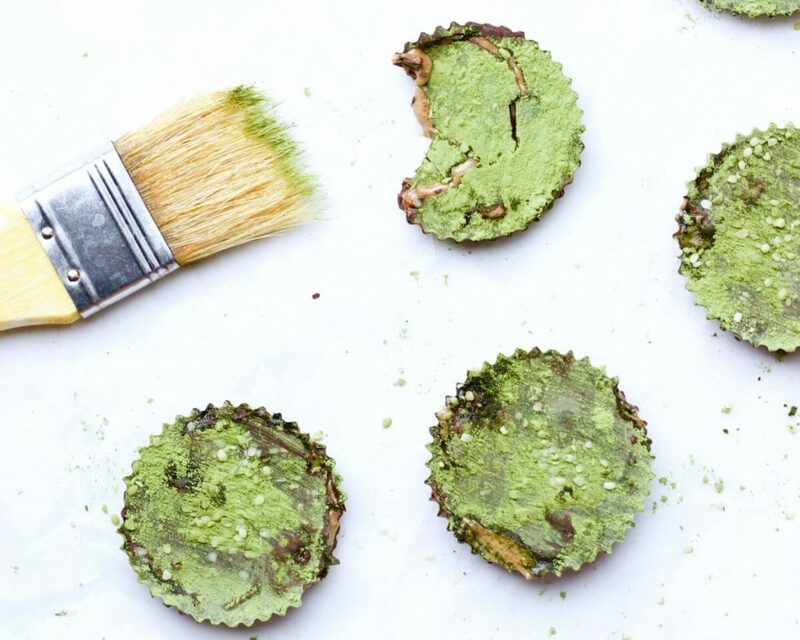 Once chilled, add the matcha to a bowl, and using a pastry brush, dust the top of each cup with matcha powder. Add the matcha to a new bowl, and when the cups are fully chilled use a pastry brush to dust the top of each with matcha powder. Because sometimes, just a couple squares of chocolates and almonds are enough. End of story. And there you have it, 5 if our favorite almond pairings to celebrate both Almond Day and Valentine’s Day. Now it’s your turn. What’s your favorite almond pairing of all time? One of these? A different idea? Let us know in the comments below!